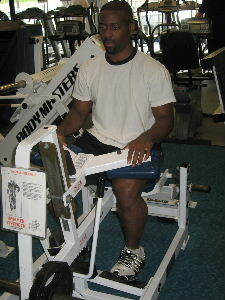 The seated calf machine is a good calf exercise. If you've read my article on the difference between the seated and standing calf raise, then you understand that different muscles are emphasized in the seated calf raise compared to the standing calf raise. When you perform seated calf raises your knee is bent, so the big superficial calf muscle (the gastrocnemius) doesn't work as well as when your knee is straight. So the other muscles (soleus and others) work a little harder relative to the gastroc during the seated version. 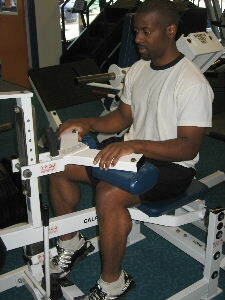 Below is a picture of a seated calf raise machine. Starting Position: Simply adjust the thigh pad so that your legs are secure in the machine, and place the balls of your feet at the edge of the platform. Form: Exhale and raise on to your tip toes. Hold for a brief second and then slowly lower to the starting position. Personal Trainer Tips: While doing this exercise you may have to reposition your feet if you feel them slipping out of position. Aim for 15-25 repetitions on this exercise, so adjust the weight accordingly. Make sure to use the full range of motion. Allow your calf to stretch at the bottom of the motion and press all the way to the top of the range of motion. If your gym doesn't have a seated calf machine, no worries. There are tons of different ways to strengthen your calf muscles.